St. Nicholas Hellenic Orthodox Church was destroyed together with the World Trade Center on 11 September 2001. 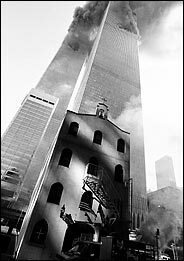 The church was located across the Liberty Street from the WTC towers, between the Washington and West Streets. The tiny church building was constructed around 1832. It originally was a residence and later housed a tavern before the founders of the parish purchased the structure. It measured 22 feet wide in front, 20 feet, 11 inches in the back, and about 56 feet long. It was 35 feet tall. On three sides it was bounded by a parking lot. Greek immigrants established St. Nicholas Church in 1916 and purchased the structure for $25,000. It was one of two old calendar parishes under the Archdiocese until 1993 when it switched to the Gregorian calendar. Among the church's unique characteristics were its small size and its icons, which were a gift from the last czar of Russia, Nicholas II. St. Nicholas Greek Orthodox Church on 20 May 2000. The cross of St. Nicholas Greek Orthodox Church in front of World Trade Center towers. St. Nicholas Greek Orthodox Church was crushed by the fall of the south tower on Sept. 11. Among the items that were salvaged from St. Nicholas Greek Orthodox Church were, from top, a book and a bell from the altar, and a gong from the bell that was atop the church. The most precious of the old church's possessions were never recovered. It is the smallest building planned at ground zero. But the architects who will compete to design the new St. Nicholas Greek Orthodox Church may face the biggest challenge. They will be asked by Archbishop Demetrios, the primate of the Greek Orthodox Church in America, for a design at once unmistakably ecclesiastical yet in harmony with the bold secular architecture around it, one that captures unearthly mystery in tangible dimensions and conveys a sense of something outside human experience. "Within this area, which experienced the horror of total catastrophe, which was the ultimate in human ugliness, you have this type of place which is not a house, not a business, not a museum, not a symphony hall," the archbishop said. "It's a religious place, which opens the realm of holiness: this total other, the transcendent." And all of this on a parcel of 5,200 square feet, set in a park across Liberty Street from the main World Trade Center site, roughly the spot where the little St. Nicholas Church stood until the morning of Sept. 11, 2001. The new St. Nicholas will not be a simple parish church, Archbishop Demetrios said, but a combination church and multiuse, interdenominational center "that offers itself to people of all faiths or even without faith." It would include an exhibition of the few remnants of the old church, which was crushed by the fall of the south tower. These include icons of St. Dionysios of Zakynthos and the Zoodochos Pege, or life-giving fountain; a small bell that once hung next to the altar; a hand-embroidered velvet Bible covering; and wax candles fused into a serpentine tangle. 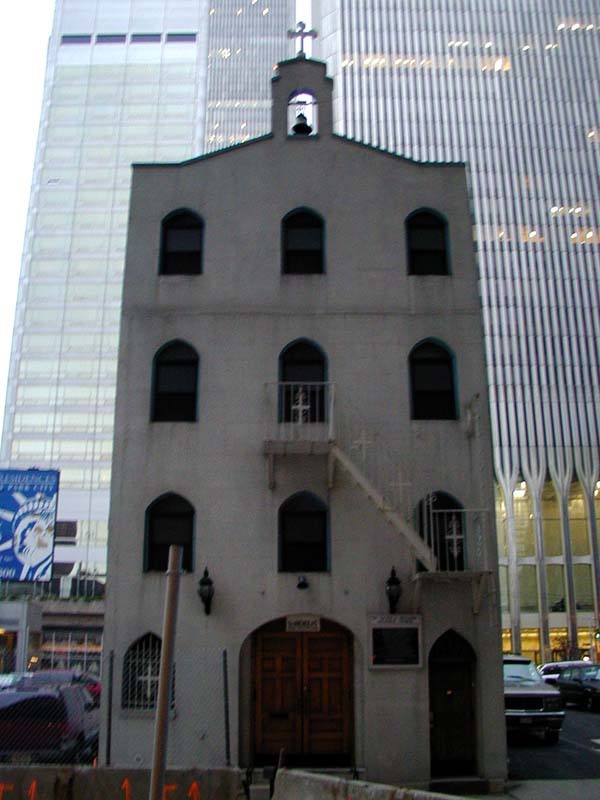 St. Nicholas Church was founded in 1916 and soon moved into a modest three-story structure at 155 Cedar Street, on a 22-by-55-foot lot, that had been built as a private dwelling in the 1830's and later turned into a tavern. The church added a fourth floor and a bell cote but still fell 106 stories shy of its giant neighbors to the north. The congregation, about 70 people from Manhattan, Brooklyn, Queens, Westchester County and New Jersey, now worships at SS. Constantine and Helen Cathedral in Brooklyn. "It is the same faces, different building," said Peter Drakoulias, a board member of the church. "Same people. Same hearts. Same hopes." Mr. Drakoulias said church members supported the idea of rebuilding St. Nicholas as a place of solace and remembrance in which anyone would feel comfortable. "It's an essential part of the mission, as far as the congregation is concerned," he said. More than $2 million in contributions have been made to the rebuilding effort. In January, the mayor of Bari, Italy, site of the 11th-century San Nicola Basilica, donated 258,000 euros (about $307,000). The lot on which St. Nicholas stood will most likely be condemned by the state; that is, taken under eminent domain. In return, the church will receive a larger parcel - 65 by 80 feet - on the same block but closer to Liberty Street. The details are not yet set, said Kevin M. Rampe, president of the Lower Manhattan Development Corporation. "The historic nature of the church and the fact that it's been there so long has convinced everyone that trying to provide space for it would be important to the future, in terms of telling the story of what happened Sept. 11," Mr. Rampe said. Daniel Libeskind, the master planner of the trade center project, said the church was "part of the spiritual legacy of the site." "St. Nicholas, as small as it was, was an incredibly moving piece of Lower Manhattan," he said. "It glowed with diversity and the beauty of meditation." Archbishop Demetrios envisions an international design contest, once the specifics of the site are fixed. 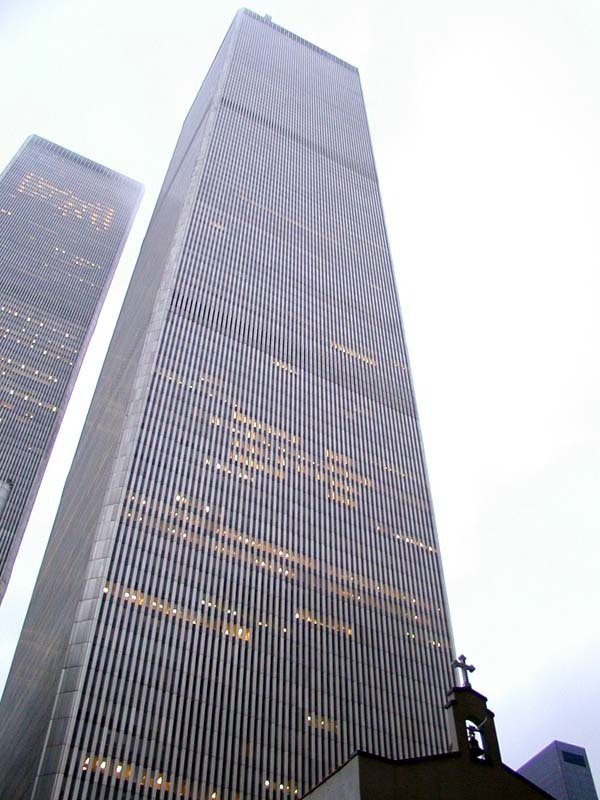 Widely published renderings of the trade center memorial showed St. Nicholas with a gable roof and belfry, but this was a kind of visual space holder. The question is whether the new St. Nicholas needs traditional features to assert its ecclesiastical identity. "You don't expect a pure Byzantine-style church," the archbishop said. "On the other hand, if you depart too radically as a totally modern structure, then that is not perhaps the best way." Negotiating this line will be difficult, allowed Nicholas P. Koutsomitis, an architect on the board of the Archdiocesan Cathedral of the Holy Trinity in Manhattan who is developing the master plan for the new St. Nicholas. "Traditionally, a Byzantine dome has been strongly identified with the Greek Orthodox church," Mr. Koutsomitis said. "The trick, in my opinion, will be to produce something that somehow has a visible element of that, yet is more of a modern architectural piece of sculpture." One of the younger Greek Orthodox churches in Manhattan, St. Spyridon in Washington Heights, was built in the early 50's, when the glass-and-steel International style was on the rise. Yet its interior is extravagantly, exuberantly traditional; every square inch is ornamented with Byzantine artwork under a high dome depicting Christ. "The traditionalist in me says that the interior should follow a Byzantine motif," said Steve Hantzarides, president of the board of St. Spyridon. But Constantine L. Tsomides, a Massachusetts architect who has followed the redevelopment of St. Nicholas, cautioned the archdiocese in 2002 that too literal a Byzantine plan "will result in a building resembling an artificial theme park." The mixture of the historic and the contemporary at ground zero runs deeper than most New Yorkers know. 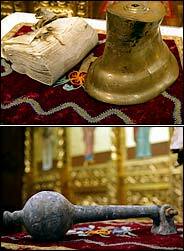 The most precious of the old church's possessions - relics, or tiny bone fragments, of St. Nicholas, St. Catherine and St. Sava - were never recovered. To Archbishop Demetrios, the notion that the saints' relics were intermingled in the dust with the remains of the attack victims only serves to sanctify the site further. "Imagine," he said, "a cemetery that somehow has been a burial place for many centuries." That first image in the New York Times article - juxtaposing the church with its impending doom, I find to be one of the most striking images of the whole disaster. Its one of the few pictures that really gives a sense of scale - showing the entire huge structure as a backdrop for a building that could stand in for any building or house we interact with everyday. Interestingly, the article did not mention the most "famous" items contained in the church (other than the relics), i.e. the icons donated by Czar Nicholas II and Czarina Alexandra of Russia. When I read the article, this came to mind. I would love to see an Orthodox church that looks like that. Unfortunately, the Orthodox church seems to be married to neo-byzantine architecture. Although byzantine architecture is beautiful and classic, it would not blend well in lower Manhattan. Interesting, but there is only so much you can do with 65 by 80 feet. I don't think that it's fair to assume that all of Frank Gehry's work will be obsolete in five years. People said that about art deco, and it's proven to be timeless. But I digress. Considering the site, I for one think it would be interesting and appropriate if the facade took on the same theme as Sagrada Familia: pristine at the top, but gradually seeming to dissolve and decay as you go further down—simply a reminder that nothing, whether material or natural, is eternal. but is NYC ready for La Sagrada Familia?